Extra thick, with a large reversible cutting surface, this cherry bread cutting board from McClure Tables is perfect for serving your favorite breads, cheeses, and appetizers. Made by hand with pride in our Grand Rapids, MI factory, each one of our cherry bread boards is designed to deliver many years of services. 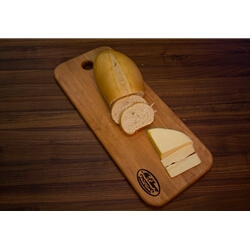 Constructed with edge grain wood, our cherry bread cutting boards are highly durable and beautiful. Our cherry bread broads are the perfect addition to any serious chef's kitchen.